But Al-Shirkuh is changing. The temperature grows colder, the rains fall less often and the desert is encroaching on the fertile lands. The jinn, once defeated, are gathering their strength; fire giants are raiding with impunity; the naga have returned to reclaim their homeland; and the withered undead of Hekata stir in their majestic pyramids. A full-colour map of the great desert. 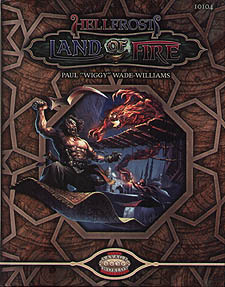 To use this book, the Game Master requires theSavage Worlds core rules, Hellfrost Player's Guide and Hellfrost Bestiary. A player needs only the Hellfrost Player's Guide.